HDX - Sig Sauer's proprietary methodology of using High Definition (HD) and High Transmission (HT) glass for ultra-high resolution optical performance and maximized light transmission. 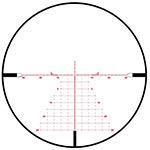 HellFire Reticle - Utilizes advanced fiber-optic technology to create and electronically illuminated reticle system capable of varying levels of intensity, from dim to bright - resulting in a clear, crisp aiming point no matter the situation. LenShield - Sig Sauer's proprietary Mil-Spec coating that sheds water, oil, and other undesirables to ensure a clear and unobstructed sight image at all times.